The President is a reality show host and the Pope is selling cars. 2018 is weird. 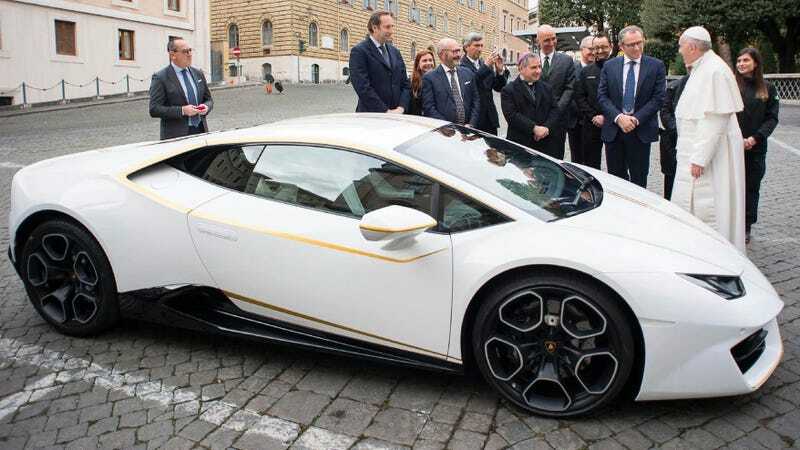 Lamborghini gifted Pope Francis a rear-wheel drive Huracan back in November. What the hell is a pope going to do with a Lamborghini? Nothing. Now it’s going to auction for charity, as promised. If you’ve been thinking about spending a lot of money on a car, money that could go to literally millions of better causes, money that you probably earned cheating somebody else out of something somewhere down the line, either knowingly or unknowingly, and all of these thoughts sort of bothered you and made you think, “You know, I would really feel like a jerk if I was seen in a really expensive car and I’m not sure if I could live—or die—with that level of pressure,” then the Pope is here to save you. Go ahead and bid on the Pope’s Lamborghini. It’s white, with some gold detailing and pin-striping, and it’s even signed by the guy. It’s just going to cost you a lot more than the original sale price of a Huracan. It is as close to a man-made chariot straight to heaven as you could get. And if you were nervous about unloading all of that money? Nothing to worry about, now. I'm the Pope. This is my Lamborghini. See... it even has my signature on it.